RADEBEUL, Germany and UXBRIDGE, U.K., May 24, 2016 – KBA‑Sheetfed Solutions, a business unit of the Koenig & Bauer Group (KBA), and Xerox today announced a partnership to develop an industrial digital sheetfed press for the folding carton market. Wide format cartons, for items like cosmetics, food and pharmaceutical products, until now has relied on traditional analogue offset production printing. Digitally printed packaging worldwide will grow at a compound annual growth rate (CAGR) of roughly 16 per cent between 2015 and 2020. Within that, digitally printed folding cartons will see a CAGR of 40 per cent1. 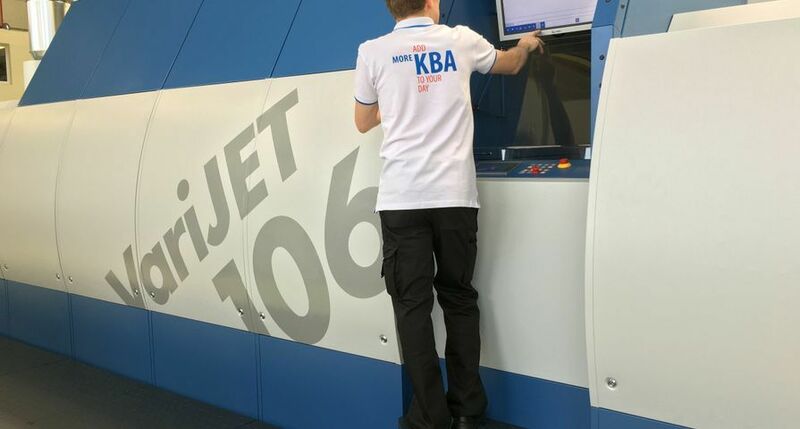 The KBA VariJET 106 Press brings the benefits of digital printing such as running multiple versions of the same carton as well as customised cartons, opening up new business opportunities for industrial production printers. Xerox®, Xerox and Design®, and Impika® are trademarks of Xerox in the United States and/or other countries. Prices, features, specifications, capabilities, appearance and availability of Xerox products and services are subject to change without notice. KBA®, Rapida® and VariJET® are trademarks of Koenig & Bauer AG in Germany and/or other countries.